Color/Appearance: Heartwood is a relatively uniform light pinkish to reddish brown; colors tend to darken with age. Random pockets of gum and natural oils are commonly present. Grain patterning and figure tends to be somewhat bland. Grain/Texture: Grain is straight or shallowly interlocked. 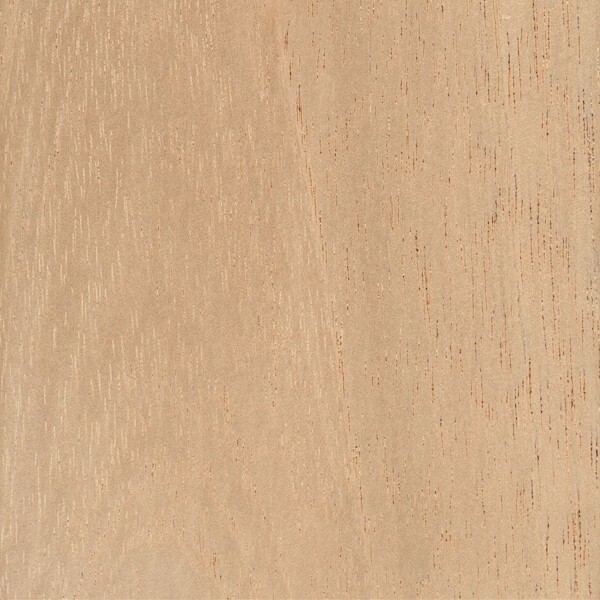 Medium texture and moderate natural luster. 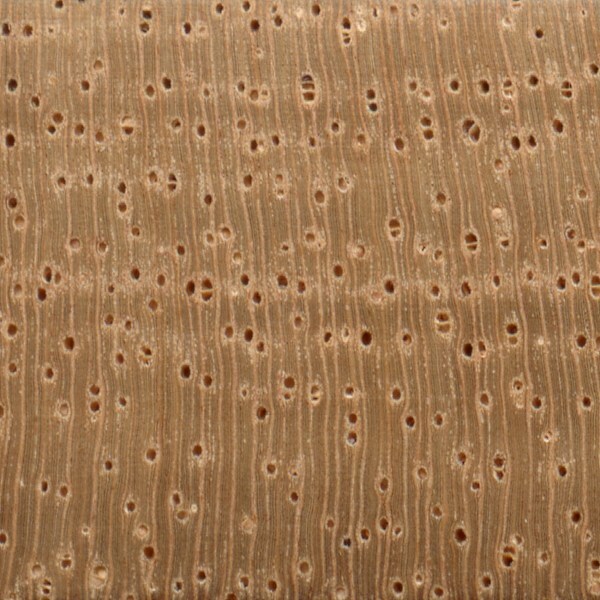 Endgrain: Can range from ring-porous to diffuse-porous; medium-large earlywood pores, small-medium latewood pores; solitary and radial multiples of 2-3; mineral deposits (red gum) occasionally present; growth rings distinct due to terminal parenchyma in diffuse-porous samples, or lines of larger pores in ring-porous samples; rays usually visible without lens; parenchyma banded (terminal), apotracheal parenchyma diffuse-in-aggregates, paratracheal parenchyma vasicentric. Rot Resistance: Spanish Cedar ranges from durable to moderately durable regarding decay resistance, and is also resistant to termite attack; the wood is also reported to have excellent weathering characteristics. Older, slower-growing trees from the wild tend to produce wood that is more durable than wood from younger, plantation-grown trees. 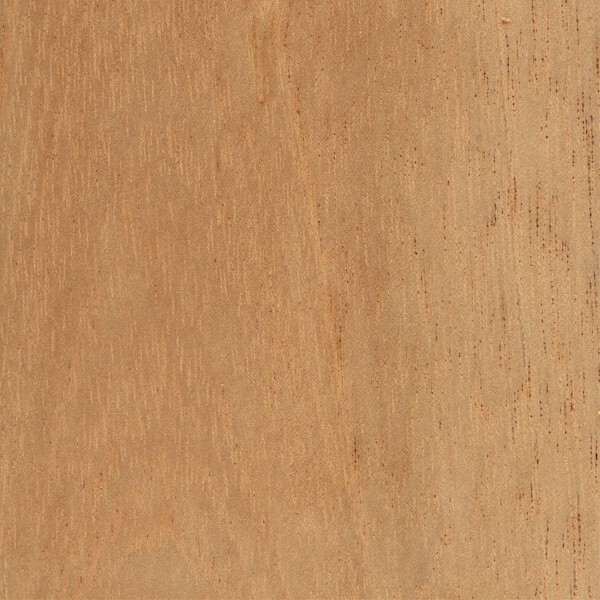 Workability: Spanish Cedar is easy to work with both hand and machine tools. However, due to its low density and softness, Spanish Cedar tends to leave fuzzy surfaces if not machined with sharp cutters; extra sanding up to finer grits may be required to obtain a smooth wood surface. Also, natural gum pockets can remain wet and may ooze out onto the surrounding surface, which can clog and gum up saw blades, and make finishing the wood a challenge. Odor: Has a distinct, lingering, cedar-like scent; this characteristic of the wood makes it a favorite for cigar boxes. Allergies/Toxicity: Although severe reactions are quite uncommon, Spanish Cedar wood dust has been reported as a respiratory irritant. See the articles Wood Allergies and Toxicity and Wood Dust Safety for more information. 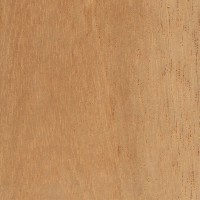 Pricing/Availability: Generally in adequate availability, Spanish Cedar is sometimes sold in thinner 1/4″ lumber for use in liners and other small craft projects. Spanish Cedar should be in the low to moderate price range for imported lumber. 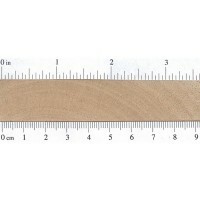 Sustainability: This wood species is in CITES Appendix III, and is on the IUCN Red List. It is listed as vulnerable due to a population reduction of over 20% in the past three generations, caused by a decline in its natural range, and exploitation. Common Uses: Veneer, plywood, cabinetry, musical instruments, (flamenco and classical guitars), humidors, and boatbuilding. Comments: A historically valuable Latin-American timber, Spanish Cedar has been exploited in many regions, and the species is now considered to be vulnerable according to the IUCN. It’s also listed on the CITES Appendix III for the countries of Brazil, Bolivia, Columbia, Guatemala, and Peru. (It’s listing in Appendix III simply means that the countries listed have voluntarily chosen to control the exporting of the wood, and have sought the cooperation of other countries to help in enforcing these restrictions.) Spanish Cedar may still be freely exported from other Latin American countries not listed in Appendix III. Not a true cedar, Spanish Cedar is actually more closely related to true Mahoganies (Swietenia and Khaya genera), as both are in the Meliaceae family. Density and mechanical properties can vary widely depending on country of origin and growing conditions; (specific gravity can vary from .30 to as high as .60 in some instances). Some of the wood available at present comes from plantations: where younger, faster-growing trees, produce wood that is lower in density, and paler in color than wood cut from trees taken from forests in the wild. 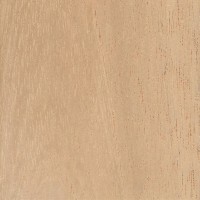 Thinking of using Spanish Cedar for outdoor kitchen cabinet doors. If my objective is to have the Spanish Cedar weather-out to gray, should I treat it at all? If I do treat it at first, then let it weather, is that a better strategy for some reason? When staining or painting Spanish cedar, use a clear wood epoxy. This seals in tannins and oils that would otherwise ruin the finish. We are a professional front door refinishing company. Kerner’s Front Door Refinishing, covington La. 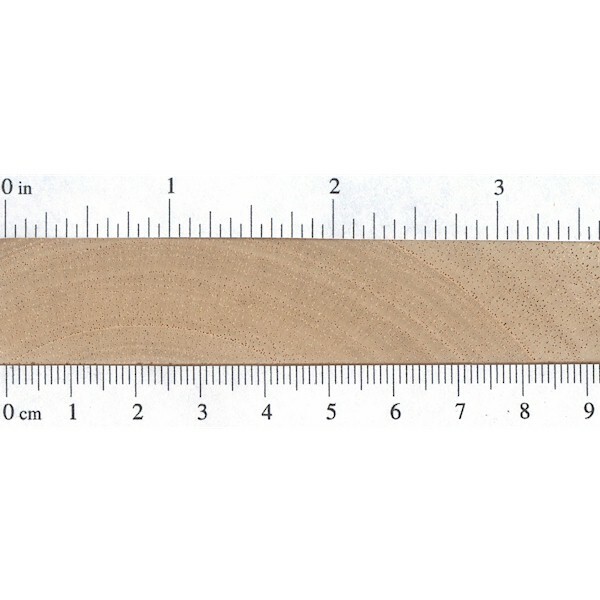 given the complaints about the naturally-coccurring oils, is there any problem using this as a tone wood for tops/bellies of stringed instruments? I have in mind to use this for making my first Lute, which doesn’t need to be perfect as it’s a first attempt, but I’d like the instrument to be usable. I have a hard time imagining what good this species would be as a soundboard, especially for a lute. Apart from its tonal properties–or rather, lack of them–I think you would find cutting the rose very difficult, due to the lack of strength in its grain. The traditional wood is White Spruce (Picea abies), which I would encourage you to use instead. 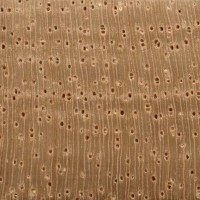 You can get an ordinary, grade A Englemann spruce (Picea englemannii) soundboard set from StewMac.com for under $20. If you want to use Spanish cedar for something, use it for the neck and end-block, but veneer or edge it with a harder wood, so the frets don’t dig in. I am a proffesional painter with over 40 yrs experience. Spanish cedar has oil pockets that seem to never dry, consequently paints (oil, acrylic, et cetera) bubble and peel over long periods of time. I encourage customers to use single coats of open coat paints like exterior oil stains or exterior waterborne urethanes. The oils tend to bleed through these paints and can be periodically washed off instead of creating blisters under paints that form a surface skin like gloss, satin and so forth. What do you mean? How will latex paint react to the oil base primer? WE HAVE HAD DIFFICUTIES IN PAINTING THIS WOOD.PLEASE ADVISE.